Author: Abul K. Abbas, MBBS, Andrew H, Lichtman, MD, PhD, and Shiv Pillai, MBBS, PhD. Sections A and B each meet the Florida 1-hour requirements in serology/immunology and molecular pathology. For ASCP, Sections A and B each provide 6 hours in serology/immunology and 6 hours in molecular pathology. Cellular and Molecular Immunology provides an understanding of the active and fast-changing field of Clinical Immunology. The authors present key updates to cover the latest developments in antigen receptors and signal transduction in immune cells, mucosal and skin immunity, cytokines, leukocyte-endothelial interactions, and more. Among the major changes in the 8th edition is a reorganization of the chapters covering T cell lymphocyte responses in order to describe more clearly early T cell activation events, differentiation and functions of subsets of CD4+ helper T cells, and functions of CD8+ cytotoxic T cells. 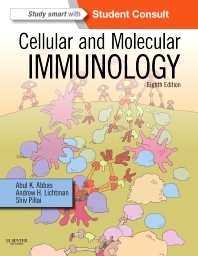 In addition, the entire book has been updated to include important recent advances in immunology. Topics that have been significantly revised include innate lymphoid cells, the developmental pathways of macrophages and dendritic cells, and immune checkpoints in tumor immunity. New principles continue to emerge from analyses of the complex systems underlying immune responses. Basic principles of immunology are now laying the foundation for development of new immunologic therapies for the treatment of human disease. These new therapeutics and the fundamental immunologic concepts on which they are based are emphasized throughout the entire book. The abundant use of illustrations and three-dimensional art, numerous figures and tables, and quick summaries in each chapter facilitate easier retention of the material. The appendixes also contain a detailed glossary, a chart showing the principle features of the cluster of differentiation (CD) cell surface molecules used to identify types of immune cells, and descriptions of commonly performed immunology laboratory tests. It will take effort to get through this book. The book will, however, serve as an excellent reference for clinical laboratory personnel working in, or otherwise interested in, the ever-changing field of immunology. Section A topics: Cells and Tissues of the Immune System • Leukocyte Circulation and Migration into Tissues • Innate Immunity • Antibodies and Antigens • MHC Molecules and Antigen Presentation to T Lymphocytes • Immune Receptors and Signal Transduction • Lymphocyte Development and Antigen Receptor Gene Rearrangement • Activation of T Lymphocytes • Differentiation and Functions of CD4+ Effector T Cells. Section B topics: Differentiation and Functions of CD8+ Effector T Cells • B Cell Activation and Antibody Production • Effector Mechanisms of Humoral Immunity • Specialized Immunity at Epithelial Barriers and in Immune Privileged Tissues • Immunologic Tolerance and Autoimmunity • Immunity to Microbes • Transplantation Immunology • Immunity to Tumors • Hypersensitivity Disorders • Allergy • Congenital and Acquired Immunodeficiencies.